1. Perfect solution for bathroom. 2. Certified by quality standards, no hard to human, water or environment. 3. Easy to use and leak free. 4. 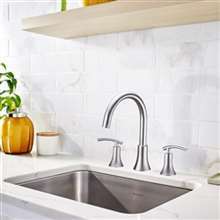 Extended durability ensured by solid construction, Stylish appearance. 5. Self powered by water pressure--No battery or other electricity required. 6. When water flows down, the LED will light instantly and automatically . 7. 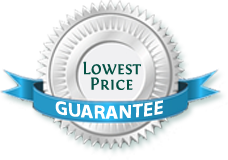 We gained high reputation with the good quality and best service from the customers . The faucet's nice and I think the LED lights are actually pretty good. It's true though that the LED lights aren't so bright as mentioned in one of the comments, but they are visible. I think this would work best in bathrooms that don't have large windows and too much sunshine. But apart from that, the faucet set works well. I bought this one for several reasons like the design, the sale price and of course the beautiful LED lights. However, I was not totally pleased with the LED lights on this faucet. It just isn't bright enough for me. I can barely see the light when I soak in the tub in the morning. Maybe its because of the windows, but still, I was expecting it not to be this dim. The overall design of this faucet is just gorgeous, which is why I decided to go for this one instead of the other one that I saw here earlier. I love the waterfall design of the spout, it just looks really nice and unique. The LED lights that turns on as the water flows is a really nice touch, and something that I actually find myself watching even if I don't mean to. 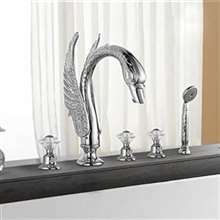 This one looked really cool, and I wanted something just like this to help modernize and improve my bathroom. So I placed an order and called my plumber the instant it arrived. It looked great in the tub, and even my plumber can't help but admire it. He said it looked of good quality, too. I'm feeling pretty proud of myself for making this choice, and I know I won't regret ever buying this one. No question about it - this is the best bathtub faucet I've seen so far. I really love the design - the cascading water while the faucet runs is amazing. Plus, the LED lights are just so cool! It just gives off this nice, warm glow as the water falls, such a pretty sight! And the best part is that the LED lights are powered by water - no electrical cords to worry about or even batteries! How cool is that? !